Make an Easter Dessert Treat! Prepare the crust by beating one-fourth cup of granulated sugar and the butter at a medium speed with a mixer. Then, gradually pour one cup of flour into the mixture. Beat the mixture at low speed. The mixture will resemble fine crumbs. Press the mixture in an eight-inch square baking pan. Bake the crust for 350 degrees for 15 minutes. Then, cool on a wire rack. Beat the eggs at medium speed until they are stiff. Add three-fourth cup granulated sugar to the mixture. Then, add the grated lemon rind, lemon juice, all-purpose flour, baking powder, and salt. Beat the mixture until it is well-blended. Bake the dessert at 350 degrees for 20 to 25 minutes. Sift the powdered sugar and sprinkle it over the top. Make Easter desserts kids love and delight your Easter guests with this incredible recipe. It is healthy and also tasty for the holiday. If you want to reduce the sugar, try natural Stevia. This will make the recipe healthier and more desirable for people with certain health conditions. 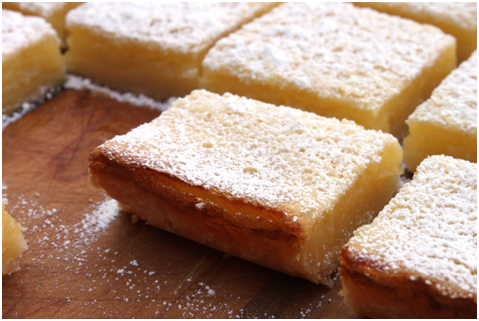 Try this recipe and serve lemon squares with berries for a healthier twist. Enjoy your Easter dessert and holiday.